Can’t stop watching movies like Sleepover and Triple Dog? Are you planning a sleepover and not sure what movies you should watch with all your besties? There are so many to choose from it can make it hard to pick a few that everyone will agree on. Get the popcorn ready (with extra butter! ), gather up the sleeping bags, pillows and blankets and settle in for a girls’ night and some great movies! Check out this list we put together for you to give you some ideas. Girls Just Want to Have Fun: Growing up with an Army colonel father, Janey has always followed the rules and stayed out of the spotlight. She is a talented gymnast, but kept to herself. That is until she entered a dance competition that is going to air on TV! She finds herself on the show and coupled with a cute dance partner. Only, her archrival is also in the competition, and she wants Janey eliminated from the competition. Typical mean girl! Revenge of the Bridesmaids: I love this movie! There is nothing like true girlfriends who have your back. Two best friends try to break up the impending wedding of their best friend’s ex-boyfriend. Their bestie’s ex-boyfriend is set to marry someone else, who only wants him for his money. She even lied and said she was pregnant! The 2 friends, Abigail and Parker, kidnap the nasty liar and bring her to the hospital and force her to take a pregnancy test, and then she admits she lied. The groom calls off the wedding at the wedding and sends the golddigger on her way. He is now free to be with the woman who truly loves him, his ex-girlfriend. The lengths your friends will go to! I hope you have friends like this. Clueless: Spoiled and shallow, Cher (played by Alicia Silverstone) takes on Tai, a new student who can’t seem to get out of her own way, and gives her a makeover. Cher vows to make her popular. Although she is spoiled, really does have a heart of gold, she just wants to help Tai feel good about herself and fit in! Not all the popular girls are mean. Bratz: They made a movie out of the well-dressed quartet! As they enter high school, they face many of the same challenges we all do. When their lifelong friendship is tested they are forced to learn what true friendship is. They are no doubt dealing with similar things that you are in school! Geek Charming: This one is a Disney Channel Original Movie, but you can still get it on DVD. Geek Charming is a great movie that you might be able to relate to! Do you have that popular girl in school who seems to be all about being Homecoming Queen? Dylan is that popular girl. She is asked to be part of a film that a ‘geek’ Josh is making to enter into a film festival, because his topic is about popularity. He ends up firing her from the film, because Dylan thinks it is her film and he thinks it is his film (which it is!) Josh ends up learning that Dylan’s mom was Blossom Queen, and her mom had died. She just wants to fill a pair of her mom’s shoes and honor her in that way. There are so many great movies you can watch at a sleepover! Check out our other list of sleepover movies! What is your favorite movie you have seen so far while spending the night at a friends house? 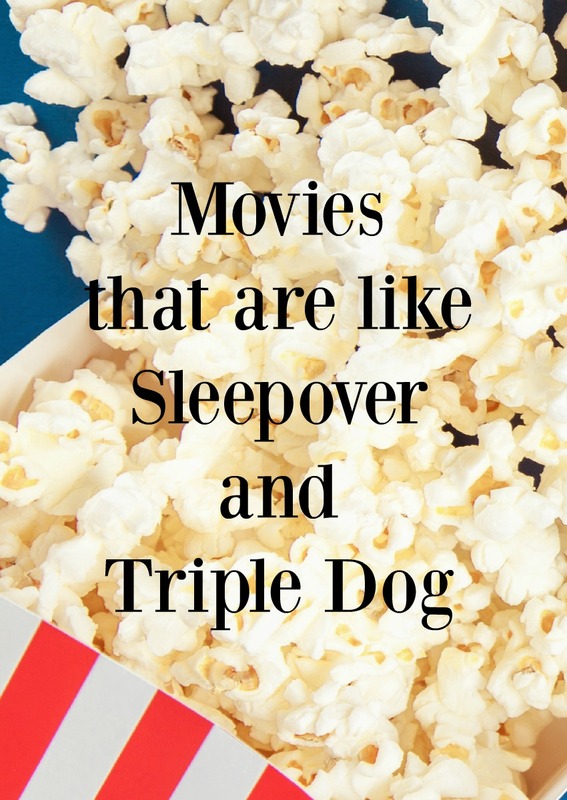 Do you know of any other movies like Sleepover and Triple Dog? Share your faves below in the comment section!